A series of four lakes with excellent parking and access. 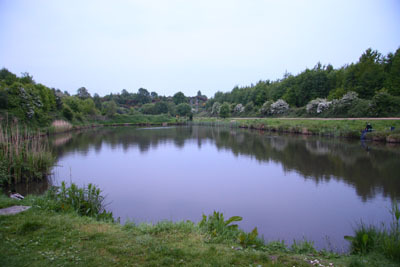 Most anglers Are attracted to the ponds by the prospect of the very good Roach and Skimmer fishing on offer. Large nets of Skimmers to 2lb are quite commonplace when using pellet, paste or small pieces of luncheon meat. Carp well in excess of 10lbs are also present along with Tench, Perch And the odd Chub. Ground baiting is allowed only in moderation. No1 Pond sometimes suffers from low water levels, this may from time to time require a keepnet ban to be imposed. Please observe all notices. Take the A614 North to Rufford. At the Rose Cottage Pub turn left and Continue to a set of traffic lights and turn left. Continue along this road For a few miles through Kings Clipstone and New Clipstone. At the next Roundabout turn left into Crown Farm Way, at the bottom of the dip turn Left into a bridleway and the entrance to the ponds is on the right. From the West Take the A617 and turn left into Oak Tree Lane, continue straight on into Violet Hill, at the roundabout (with the winding wheel) turn right into Crown Farm Way, continue to the next roundabout and turn left. Turn into the bridleway on the right at the bottom of the hill.